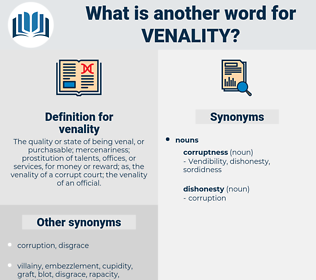 What is another word for venality? 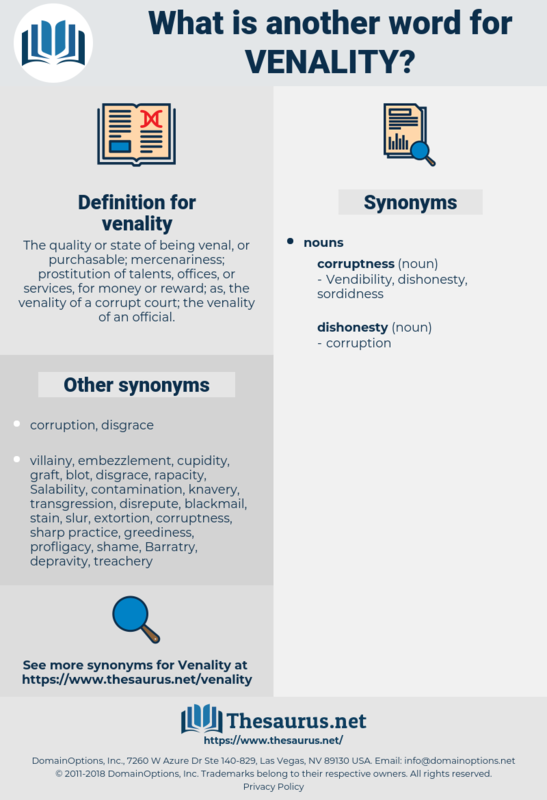 The quality or state of being venal, or purchasable; mercenariness; prostitution of talents, offices, or services, for money or reward; as, the venality of a corrupt court; the venality of an official. He wrote to his successor, Mr. Vansittart, when he transferred to him his own office, that the only danger he had to dread in Bengal was that which might arise from venality and corruption. But the Volunteers had committed the fatal mistake of not obtaining the exercise of the elective franchise for their Catholic fellow - subjects: hence the Irish Parliament obtained only a nominal freedom, as its acts were entirely in the hands of the Government through the venality of the members.